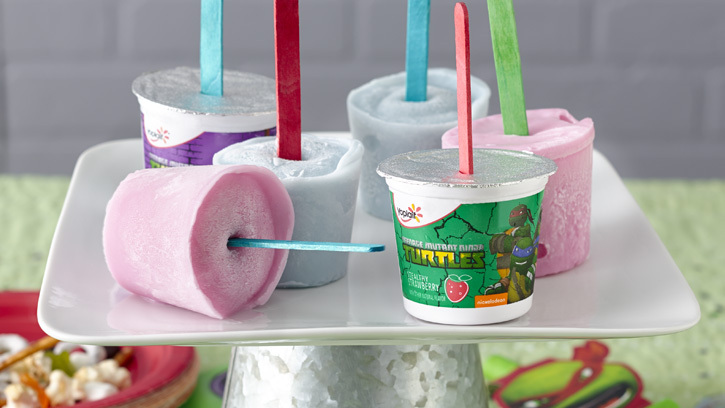 » Yoplait Kids Yogurt- Great Ideas and Coupon! 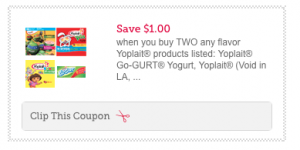 Home » Coupon » Yoplait Kids Yogurt- Great Ideas and Coupon! Yoplait Kids Yogurt- Great Ideas and Coupon! I recently told you about my kids yogurt find (Hello Kitty Yoplait and more) that you can find at Price Chopper for $1.99. Maybe Yoplait heard how much my daughter liked it (though she often doesn’t even finish a cup she did declare, “It’s so good, I could eat more than one every day!”) and they sent me 3 packs to try. One of each of their newest kinds- Teenage Mutant Ninja Turtle, Hello Kitty and Despicable Me. I like the yogurt because they do not use artificial colors or sweeteners. And no high fructose corn syrup. There’s a new coupon to print for .35 cents off one pack. This will double at Price Chopper (making it only $1.29 a pack) and at ShopRite. There is also a coupon on Betty Crocker’s website for $1 off 2. This makes a great coupon to double at ShopRite this week (they are doubling $1 coupons until the 27th! ), where it is on sale for $2.49 a pack. Disclosure: The information and product have been provided by General Mills through Platefull Co-Op, though all opinions are my own. This entry was posted in Coupon, Price Chopper, ShopRite and tagged coupon, Yoplait. Bookmark the permalink. ← Win Early Admission Passes to the Pass it On Kids Sale!